Nigerian born British boxer, Ola Afolabi has emerged the interim World Boxing Organisation, WBO cruiserweight champion. The 31-year old Afolabi, (19-2-3, 9 KOs), took his Russian contender and former interim title holder, Valery Brudov (39-4, 28 KOs) to the cleaners in their bout held at the Esprit Arena, Düsseldorf in Germany early Sunday. Referee Gino Rodriguez saved Brudov from his own bravery after the fifth round to stop further punishment in the hands of Afolabi. Brudov, who accepted the fight two weeks ago, was rusty but willing to bring some heat to the WBO number one Afolabi, who was also ranked number four by the WBA and number seven by both the WBC and the IBF. Brudov marched forward and threw looping shots but the British pugilist easily slipped them with his supreme defense. He kept Brudov at the end of his jab, while adding stinging right swings occasionally and left hooks to the body to make Brudov’s diet a bit more diverse. In the third round, Afolabi went after Brudov and landed two right shots to put him down on his knees. Brudov, 35, refused to surrender and continued to fight. The fourth stanza also ended in Afolabi’s favor. He wasn’t very active but when he opened up he tagged the Russian once again. The punishment continued to accumulate in the fifth, and midway into the round, Afolabi landed several left and right hand bombs, which knocked Brudov down for the second time. He got up and went on, trying to harm Afolabi, but the Nigerian landed several huge right hand bombs at the bell. Brudov didn’t go down but he was dazed and wobbly, forcing referee Rodriguez to stop the bout. 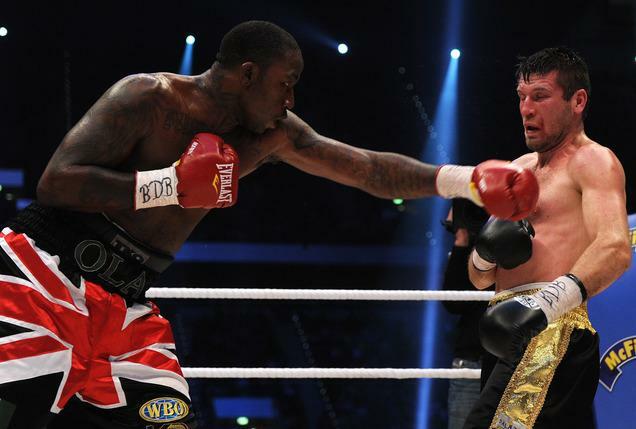 Afolabi may battle WBO full champion Marco Huck, if the interim champion decides to stay in the cruiserweight limit.